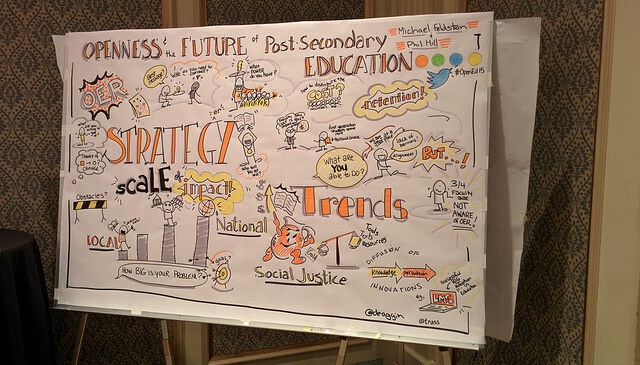 I have just returned from OpenEd 2015 in Vancouver, a conference focused on exploring developments in open educational resources (OER) and open educational practices. I attended this conference when it was last hosted in Vancouver in 2012 and was delighted to see it return to the area. The conference attracts many top researchers in this field from around the world. The main themes I experienced at the conference this year included OER adoption models and accessibility, open data, and open research and pedagogy. We are incredibly lucky in British Columbia to have a very successful OER initiative supported by the province and managed by a great team at BC Campus. There are currently 132 open textbooks in the BC Campus collection which can be accessed freely online in multiple formats (web, pdf, epub, mobi, xml, html, and odt). Many of these textbooks have already been adopted at institutions across BC; in total BC Campus estimates 285 course adoptions with potential student savings in excess of 1 million dollars! Some programs are going as far as committing to zero-textbook-cost degree programs which exclusively use OER throughout the curriculum. When you adopt an open textbook you save students money by not requiring them to buy an expensive text. Furthermore, if you find something that does not fit within your curriculum you can easily adapt or drop parts of the text you do not intend to use. The open copyright license on these textbooks allow you to distribute the materials online in multiple ways, making open textbooks great starting points for building online and blended courses. Additionally, BC Campus is actively involved in ensuring the texts meet accessibility requirements. The argument for open textbooks contributing to student savings is clear. How many of our students opt not to purchase their textbook due to financial constraints? How many make the purchase for use over a semester then sell it at half the cost? How many keep the text but never open it again? Rajiv Jhangiani a Faculty member and OER Advocate from Kwantlen Polytechnic University made the argument that open textbooks enable greater academic freedom and autonomy to instructors. Rather than prescribing a book and accepting all of its highs and lows, an instructor can select, adapt and configure an open textbook as they see fit. One can essentially tailor the resource to specific pedagogical goals potentially contributing to better student outcomes. It seems that open textbook initiatives are emerging across the world now. I will add the multiple repositories that were presented to the VIU Open Educational Resources directory as soon as I work through all of my notes. One of the affordances of online educational resources is our ability to embed assessment and gather analytics around content. A major theme of the conference explored how this data might be used to improve educational experiences, contribute to our understanding of the science of learning, or create opportunities for intervention. It’s impossible to tell when our students last opened their textbook, but with OER there are increasingly ways to review analytics of student access and engagement. This area of research is still emerging as accessing and collating analytics in this way is still quite messy, with multiple delivery platforms and emerging metrics. If you are interested in exploring further check out Learnsphere which is building a collection of transactional data harvested from online courses. Also see the Simon Initiative from Carnegie Mellon University a unit actively involved in developing this area. I was delighted to have an opportunity to catch up with my masters supervisor from South Africa who was also at this conference presenting. Cheryl Hodgkinson-Williams presented on the Research on OER for Development (ROER4D) project. This ROER4D project is investigating the impact of OER in South America, Sub-Saharan Africa and Southeast Asia. The project has maintained an open philosophy throughout the research process ensuring that all of their processes, methods and findings are available ideologically, legally, technically, and practically. It’s an exciting and massive undertaking for the project team in coordinating a global project and doing so completely openly. UBC presented on their approach to offering open infrastructure for faculty to build open education project upon. I have always been impressed with the success of the UBC Blogs network and UBC Wiki. By providing flexible and open technologies to build upon, the UBC community has created some impressive projects including The Phylo(Mon) Project, an exercise in crowd sourcing, open access, and open game development which resulted in a beautiful biodiversity trading card game. Virginia Commonwealth University (VCU) presented on The Great VCU Bike Race Book, an initiative where faculty from the university created a short course around a community cycling event. Students could enroll for a reduced rate, which included university credit, and were tasked with learning opportunities related to the bike race such as, GIS modeling the race, anthropological explorations of the crowd at the event, capturing the event through photography and film, exploring the history of the race and the sport of cycling, among many other areas of interest. All students blogged their work which was brought together via an aggregator creating a rich resource! What a marvellous project as students engaged with the community, conducted research and then shared their research openly. Also shared was the Agora Project an open, blended faculty development experience created by the JIBC and the University of Guadalajara (UdG). All based around open practices, participants experiment with active learning strategies, remix projects or multimedia creation in their classrooms and reflect and report back on successes and challenges. Overall OpenEd 2015 provided lots of refreshing and inspirational ideas for thinking about open educational resources and open educational practices. The latter is what interests me most as we move towards having greater access to OER and technologies which enable more open practices. Cable Green from Creative Commons put the relationship between the major areas of open with his quotable “OER + Open Data Analytics + Open Pedagogy all in service of the learner.” I like this statement as it reminds us what the open education movement is all about, improving the experience of our students.